The April 2017 edition of the Swimming Times features an interview with former swimmer Eddie ‘The Beast’ Hall. At 6ft 3in and 30 stone, with a fearsome scowl and ‘THE BEAST’ tattooed on his inner arms, Eddie Hall looks like not only the strongest man in Britain and arguably the world but one of the scariest. But as he talks about his swimming past and his global ambitions on the strongman stage, you realise that this father-of-two is really a gentle giant. But a giant who will leave no stone unlifted to fulfil his aim of becoming the World’s Strongest Man. It’s a target that requires supreme dedication and a competitive edge. They are attributes that Eddie has in spades – and he credits his swimming background for much of that and also for some of his physical talents. By his teenage years, Eddie’s sporting talents had already taken him to the very top of British age group swimming. At the ASA National Age Group Championships in 2001, he won gold in the 13yrs 50m, 100m, 400m and 1500m freestyle and silver in the 200m. “That was a walkway moment where you realise training can pay off and you can achieve great things. That set me for life, I think,” he said. A year later Eddie won gold in the 14yrs 400m and 1500m, silver in the 100m and was fourth in the 200m. In the 30-length race, he shared the podium with Dan Fogg, the 14yrs bronze medallist, who went on to make the London 2012 Olympic 1500m final. Eddie’s winnings inevitably brought him to the attention of national performance director Bill Sweetenham and his team and he was selected for the World Class Potential programme. Although he made the decision to stop training and competing, Eddie has always continued to swim and is grateful for the long-term benefits that swimming brought him. “Although I stopped competing in my teens, I’ve never quit swimming,” says the 29-year-old. ‘I’ve always swum but I’ve just used swimming as a keep fit. 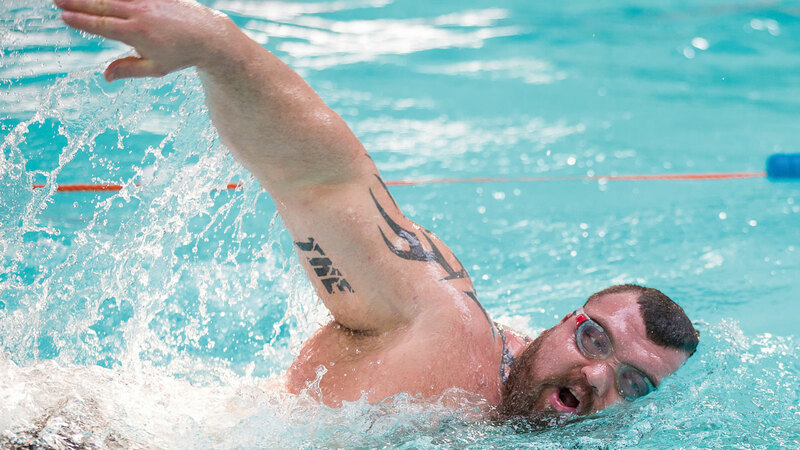 Swimming still forms part of Eddie Hall’s training regime – and he believes his background in the sport gives him an edge over his strongman rivals. “I try to swim at least once a week, usually on a Sunday afternoon,” he says. I do hit-training, where I try and keep my heart rate above 150 beats per minute for about 50 minutes. “The way I do that is to do two 25m lengths in the pool at very fast pace. It usually takes me about 40 seconds to do two lengths. Then I’ll have about 1 minute 20 seconds rest. “As that 1:20 comes to an end, my heart rate’s dropping to about 145 to 150 and I go again. So I am always keeping my heart rate above 145 to 150 for 50 minutes. “That increases your cardio-vascular system massively. It also helps mobility in my shoulders and my spine. It keeps me mobile and I think that’s why I’m one of the most collapsibly mobile guys in the industry. “Even at 30 stone I can still get my palms on the floor and with the overhead stuff I’m getting my hands behind my head and pressing. In April’s Swimming Times magazine Eddie reveals more about his ambitions, training routine and his daily 12,000-calorie intake. The issue also features Olympic diving champions Jack Laugher and Chris Mears as they share their thoughts on Rio and the future whilst Adam Peaty focuses on continual improvement and sets his sights on more medals and more records.